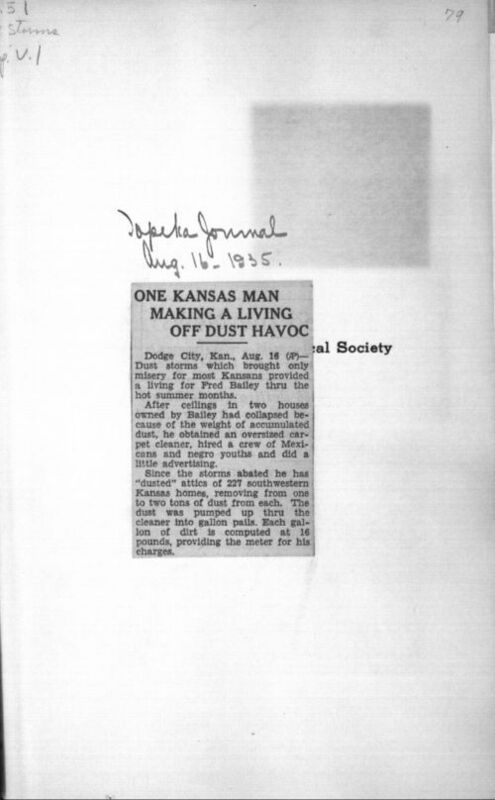 This very brief article describes how Fred Bailey, an enterprising citizen of Dodge City, Ford County, began a business for "dusting" attics. Thanks to the dust storms of the 1930s, many houses had layers of heavy dust in their attics that could potentially cause the ceiling to collapse. Bailey vacuumed the dust out of 227 homes over the course of the summer, removing from one to two tons of dust from each attic. This fascinating piece demonstrates the severity of these storms and the unique challenges that Kansans faced during the Dust Bowl years.